Of the top economic powers in the world, 69 are corporations and only 31 are countries. Businesses now set the pace for technological change and social innovation. Where business leads, society follows. Any business investor knows that the strength of good investing lies in calculating risk and reward; low risk is often a sign of low reward. Could we apply this to the world’s most pressing social issues too? Finding solutions to the world’s greatest problems requires an appetite for risk taking; for supporting solutions with large upfront capital, without evidence of success. While the returns in terms of social progress, productivity and wellbeing could be huge, the potential for failure and loss is enough to put off many but the most adventurous private philanthropists . I have dedicated over a decade of my career to tackling the issue of poor vision. There are over 2.5 billion people around the world who need vision-correction but have no access to it, leading to drastic health costs and lost productivity that costs an estimated $3 trillion every year. Deemed an insurmountable challenge by the institutional world of professionals, industry and policymakers, tackling the global vision crisis meant confronting risks and unknowns. But finding and catalysing a solution would have dramatic repercussions for a country’s productivity and could revolutionise people’s lives and wellbeing. Through betting on a pioneering vision-screening protocol which trialled new affordable glasses and loosened regulations on who could provide sight tests, Rwanda has become the first developing country in the world to implement universal primary eye healthcare, with vast benefits for all its citizens. Matching the success of the exhaustive efforts in one small country with a global effort to drive change carries greater challenges. Democratic governments struggle to take the necessary risks, or to provide the long-term stability needed to create change and see projects to their end. Businesses, on the other hand, are ambitious and impact-orientated. Published at Davos this year, the Young Presidents’ Organization’s Global Leadership Survey found that business leaders believe the private sector is the best sphere in which to yield social impact, with 51% considering government regulation an obstacle, rather than an aid, to doing good. Businesses who want to do good should note that tackling poor vision by providing vision correction to their workforce is a low-hanging fruit. Around 90% of cases of poor vision worldwide could be solved by a simple pair of glasses that cost as little as $1.50 – a solution that has been around for over 700 years and is so often taken for granted in the developed world. A number of firms, including American consumer retail giant Williams Sonoma, have started to implement eye tests and provide low-wage workers with vision-correcting glasses. The rewards are huge. Workers’ wellbeing is dramatically increased – not only in helping them see better but in preventing fatal injuries with heavy machinery or in road traffic accidents. A very modest investment makes huge business sense by reaping rewards for employers - through improved worker productivity and employee retention - and workers alike, through being able to earn for longer and in their improved general wellbeing. This is a clear win/win. 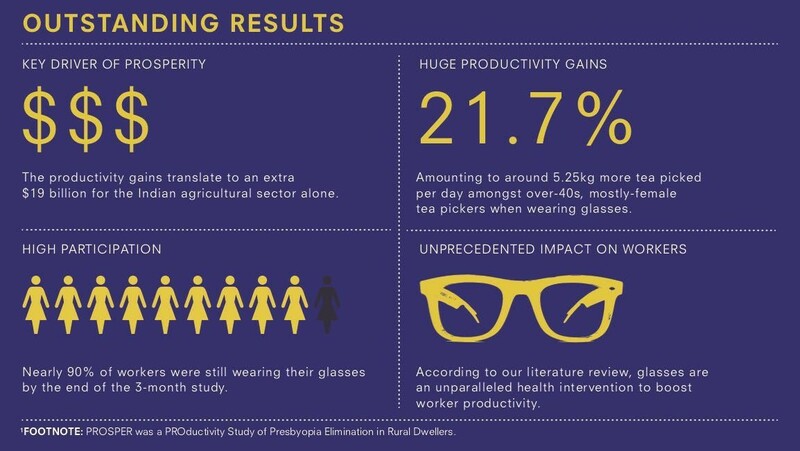 Research published in The Lancet Global Health shows that the simple provision of glasses to tea pickers in Assam, India, improved productivity by an average of 22%. This is the equivalent to one whole working day a week, a productivity increase unmatched by other primary health interventions. More than nine in 10 participants in the study would recommend glasses to other workers – and it is fundamental these programmes are embraced by those involved if the required investments are to be successful and sustainable. Even more strikingly, for those aged over 50 the increase in productivity was close to 32%. The implications of primary eye healthcare and glasses in helping older workers stay in work are huge – not to mention reducing poverty, helping younger family members to stay in school, improving health and wellbeing among elderly members of the community – the list goes on. This is startling and indisputable evidence for the power of glasses. More importantly, for business leaders, it is a sign that real, affordable and existing solutions have been trialled and de-risked. Now the World Health Organization and Commonwealth Heads of Government are coming onside, and there is now a dedicated working group within the UN, The Friends of Vision, devoted to putting forward multilateral resolutions that will transform this into global action. We need to find more ways to build strategies for the business sector to drive change. This is undoubtedly the best way forward, not only for poor vision but for issues of education, gender equality, pollution, and other pillars of the sustainable development goals.